A powerful solution that’s both productive and secure. Clean and stylish, with its space-saving borderless design, the Lenovo V510z is the AIO that keeps things simple – so your focus stays on business. You’ll experience powerful productivity with the latest Intel 7th generation technology – and find it easy to manage thanks to its clever tool-less design. Always-on features keep everyone connected, whilst intelligent face recognition camera supporting Windows Hello keeps your data secure. Plus it’s energy smart – so you save on costs too. 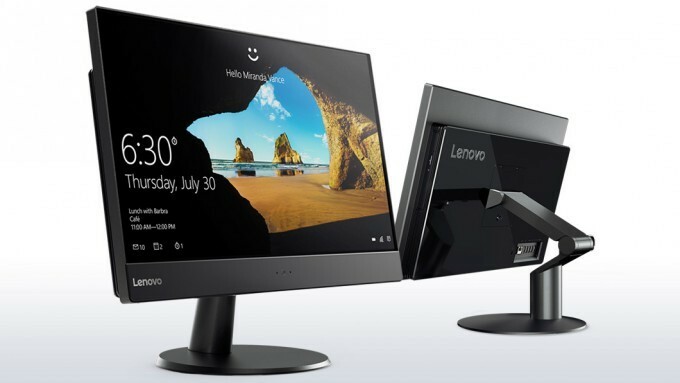 Whatever you need to do, the Lenovo V510z AIO simply gets the job done. Simple to use, the V510z is tool-less — which means you can easily remove or replace the optical drive, SSD, or memory without any gadgets or complicated procedures. Delivering the latest Intel 7th generation processor. With dual SSD and HDD you’ll experience almost a 35% improvement in boot-up time, 1TB of storage, and faster le loading times. Lenovo Ultraslim Plus Wireless Keyboard and Mouse - U.S. English, Advanced 2.4 GHz wireless technology, Plug and play nano size receiver, Soft touch finish, Low profile, island-style key design, One touch controls, Fn key, Spill resistant design, Ambidextrous, three-button design, Scrollwheel, High definition laser sensor, Battery life indicator.